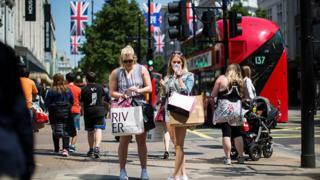 UK consumer spending fell for the third month in a row in July, according to research from credit card firm Visa. Compared with the same month a year ago, spending fell by 0.8%, slightly faster than the 0.2% decline in June. Spending has now dropped for the past three months, marking the longest falling streak in over four years. Transport and communications spending, which dropped by 6.1% year-on-year, and clothing and footwear, which fell by 5.2%, saw the biggest decreases. Food and drink spending was down by 0.5% annually, while spending on household goods fell by 4%. Household goods spending has either fallen or stagnated each month since last December, Visa said. Bucking the downward trend, spending in hotels, restaurants and bars rose 6% year-on-year. Visa UK & Ireland managing director Kevin Jenkins said the increase suggested "an early surge in summer staycations, as the weak pound made holidaying at home more attractive." But overall, he said the June figures were further evidence that households are feeling the squeeze from rising prices and stagnant wage growth. "The drop in spending was felt across a broader range of retail sectors last month, with clothing, household goods, food and transport among the worst hit," he added. As well as hotels, restaurants and bars category, recreation and culture also saw a return to growth (+1.3%) after a slight fall in June. The figures are compiled for Visa by IHS Markit.